Looking for a portable battery solution for your USB-C devices that handles all of the wiring for you? Well myCharge may just have what you are looking for with their HubPlus C Portable Charger. The HubPlus C Portable Charger is a 6700mAh rechargeable battery with built-in wall prongs, a micro-USB cable and a USB-C cable. You also have a USB port, opening up your charging possibilities even further. With the USB port and cables combined, the HubPlus C can charge up to three devices at once. The cables stow away neatly and compactly into the HubPlus C, and the USB-C uses Qualcomm Quick Charge 3.0 for high-speed charging of your mobile devices. The HubPlus C sports a sleek aluminum body and fits in the palm of your hand. Out of the box, the HubPlus C is ready to go as it comes pre-charged. So if you happen to be overnighting a brand new HubPlus C for a trip the next day, your arriving HubPlus C is as ready for your trip as you are. Simply take it out of the box and head off. 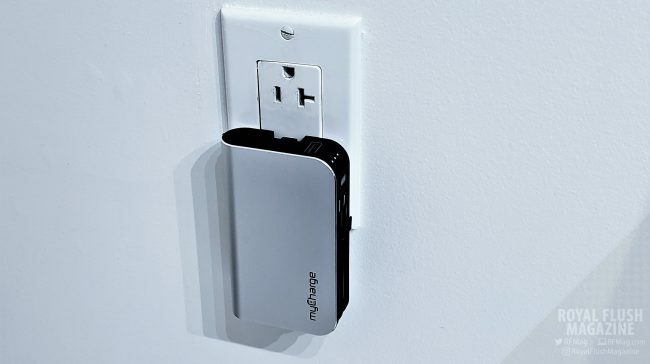 With its ability to charge devices whilst plugged in and charging itself, it makes for a handy and compact tool to have in hotel rooms or places where outlets and charge ports are scarce. For the ready right out of the box trials, we threw the HubPlus C at a drained Samsung Galaxy S9, which houses a 3000mAh. We took the HubPlus C right out of the box and plugged it into the S9 when the S9 was at 31% battery life. As soon as we plugged it in, the S9, like most smartphones now days, immediately recognized the “fast” charging. That meant that the Qualcomm Quick Charge 3.0 was working without a hitch. After an hour of charging, the S9 was at 91% battery life, which was in the neighborhood of the phone’s estimation as to how much it needed. About 60% of charging for the S9 left the myCharge HubPlus C’s battery at a little under than the midway point, going by the LED indicators. Then a couple of days later, without charging the HubPlus C at all, I threw it again at the S9, which was at 18% battery life. This next charging run drained what was left from the HubPlus C in about 38 minutes, while bringing the S9 to 60%, which is a 42% boost. This was not bad at all. It most likely had more to do with fact that the S9 was on, actively draining its battery while HubPlus C was working to charge it. Surely, the S9 would have charged much faster and more economically if the phone was off while being recharged by the HubPlus C. However, I felt this was a more practical use case considering that most people who are frantically trying to charge their device on the go are doing so because they need their device to remain on. That said, you could get about two good Samsung Galaxy S9 charges if you turn off the phone beforehand, with each charging session being much shorter that it was with the above tests. So if you have devices that charges via USB-C, you’re in for some fast and generous charging. The myCharge HubPlus C’s 6700 mAh battery is more than enough to fully charge most portable devices, especially with those devices powered off. Even the Nintendo Switch portable console’s battery is only 4310 mAh, just to give an idea. If you have devices that don’t use USB-C, you still have a microUSB option as well as a USB port. Not to mention that having a USB port opens the door to practically any charge cable that may be unique to what you are charging. The HubPlus C did take a small handful of hours to charge itself when plugged into a wall, untethered to any other device. It was hard to measure, but about three hours seemed to be enough to fully charge the HubPlus C. Should you not use the HubPlus C for a long period of time, you don’t have to worry too much about the battery discharging. The product touts a Power-stay feature that allows the battery to maintain its power for up to one year. We definitely didn’t have it for a year, but on paper, it adds some integrity to a product that may be stowed away for long periods of time without use. I definitely like the myCharge HubPlus C, if not for its portability, then for its overall practicality in charging methods. With one outlet, you can charge the HubPlus C as well as three devices at the same time. After which you can pop out the HubPlus C for more charging of other devices on the go. The HubPlus C is lightweight, sleek and fits in the palm of your hand. It is a simple product that gives you so many options while not breaking the bank at $79.99. If you’re going on a trip and you need a compact portable power solution that can handle three devices at once, you should definitely check out the myCharge HubPlus C Portable Charger for yourself here.